On January 31, 2014, we had a wonderful Q&A Interview with Robert A. “Bob” Emmons, Ph.D., the world’s leading scientific expert on gratitude, Professor of Psychology at the University of California, Davis and author of the new book, Gratitude Works! : A 21-Day Program for Creating Emotional Prosperity. The author of the bestselling book Thanks! 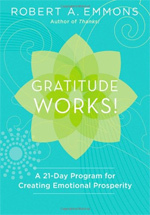 as well as 4 other books on gratitude and positive psychology and the founding editor and Editor-in-Chief of the Journal of Positive Psychology, Bob Emmons has been called the “gratitude guru.” He has indeed become the world’s foremost authority on gratitude, a sometimes overlooked component of happiness. But is he a practicing “expert” who has achieved an enduring mindset of Thanks-giving, even when encountering life’s difficulties and dark times? As is true with any change or learning that requires sustained discipline, it can be difficult–even downright painful–to shift ingrained thinking patterns and negative reactions so we can truly live in gratitude and appreciation. Bob Emmons readily admits that gratitude does not come easily or naturally to him–and wonders if that’s partly why he studies it. He reads about it, conducts research, thinks and writes about it, gets insights from colleagues, and speaks to audiences about it. But he finds it difficult himself to sustain the practice of gratitude (and reports his wife would fully agree with this observation!). With a history of taking life pretty much for granted, Emmons recognizes it requires strong intention and sustained effort on his part to redirect his attention if he wants to live with an “attitude of gratitude.” And he notes that accepting humility, or becoming aware of connections and realities greater than ourselves, seems to be a precursor to having a grateful response. Emmons, whose initial work focused on whether gratitude really worked and the benefits of adopting thankfulness, has now turned his attention to sharing research on “how we can get more of it.” Gratitude Works! is a manual for recognizing our essential interdependency and introducing humility and thankfulness into our daily lives. Citing evidence-based practices, and positive outcomes from regular gratitude practice, Bob offers practical tips for fostering gratitude as a way of life–a lifestyle change. Collected research findings from the science of gratitude are surprising, counterintuitive, and compelling, showing that gratitude is worth practicing, worth striving for, and absolutely life-changing–for the better. Did you know that remembering one’s sorrows, failures, and other painful experiences is more beneficial to happiness than recalling only successes? That reflecting about one’s own death can produce an increase in gratitude? That watching a tear-jerker increases gratitude more than watching a comedy film? Can you guess differences in gratefulness between women and men, and how the different sexes might benefit best using various gratitude practices? What if you’re not into journaling gratitude daily-the standard way to observe and increase thankfulness? Are there other–even better–ways to boost gratitude? Why is so difficult for some of us to be grateful–can we change that? And how is it that having gratitude can heal and positively redirect a person’s life? Gratitude does work! Thankfulness is important not only because it helps people feel good, but also because it encourages them to do good to others. By reaching outside themselves to appreciate gifts they’ve received, they gain a perspective of belonging to a larger, intricate network of sustaining, mutually-reciprocal relationships and are then more motivated towards future benevolent actions towards others. In Bob’s newest book, he shares his own learning about growing and sustaining a gratitude practice that can yield positive change for ourselves, our clients, and the wider network of humanity. Reviews for Bob’s new book, Gratitude Works! 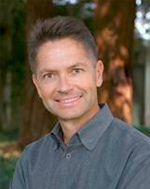 Besides his role as editor of the most important journal in the field of Positive Psychology, Bob has published over 150 articles for academic and popular media, has had and continues roles as editor, editorial board member and reviewer for over 18 other professional journals, and is author or editor of six books in the areas of positive psychology, health, and spirituality, including Thanks! How the New Science of Gratitude Can Make You Happier(Houghton Mifflin Harcourt), The Psychology of Ultimate Concerns: Motivation and Spirituality in Personality(Guilford), Words of Gratitude for Body, Mind and Soul, The Psychology of Gratitude (Oxford University), andStudying Persons and Lives (Springer). He is Past-President of the American Psychological Association’s Division 36, The Psychology of Religion.